Complete website solution, including initial consulting, web design concept, programming development, research and writing of all static content, elements of search engine optimisation, as well as custom-built content management system (CMS). The Wellness Medical Spa Cyprus is a unique and innovative facility in Nicosia that integrates the fields of beauty, cosmetic care, health, anti-aging, and supported by fully certified medical knowledge. A relatively new clinic, and the only one of its kind in Cyprus offering a combination of holistic wellness therapies, spa treatments, together with medical cosmetic care. 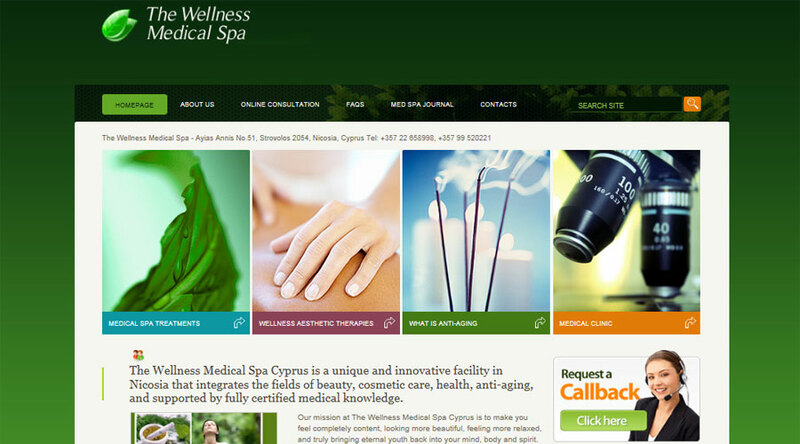 Focus for this project was to deliver a functional and nice-looking website for promoting the wellness med spa, both in terms of being found in common search engine results, as well as for offering overall professional credibility. Content offers a variety of information about the practice in general and the different departments. Although dynamic content is not so readily used, the website still manages to achieve very good results in online presence, no doubt driven by the site's infrastructure and well written static content. Indeed, if new pages and content were created via the CMS, the site would achieve a lot more.